A while back, I wrote about how I had ditched the art history survey textbook. A healthy discussion ensued in the comments section about whether or not the art history survey needed a textbook as a course resource for students. Although I have some sympathy for those who still regard the survey text with fondness, I have found it incredibly liberating being free of Stokstad and Janson as the go-to for my survey syllabus. Those tomes put me and most every student I’ve met to sleep (which doesn’t help – we’re already in a darkened room!). I’m happiest to have let them go because – as I’ve said before and as we all know – they’re expensive. I feel unethical asking students at a city college to fork out so much money. These texts have a place, for sure. I just think it’s probably in the library, as a research resource. If you’re a humanities major, if you know you’re going to use the text beyond the boundaries of the semester you’re taking the course, if you’re a budding art historian – heck, if your parents are footing the bill and don’t mind how many books you buy – this is when it might make sense to have personal access to the latest edition of Survey Text X for $100+. Past editions can be found really cheaply online and so are great to nudge students towards if you want them to have a physical chronology mapped out in front of them during the run of the course. However, my primary audiences for the art history survey are – at Baruch, at least – majoring in math, business, finance, and accounting. They are sophisticated students, but they want bitesize chucks of information first, and then depth later as they gain a foothold on the material. They want to watch it or listen to it rather than only read it. And they don’t want to spend any money on said information in textbook form, because it doesn’t relate to their major. For the last few years, I’ve been using excerpts from Neil MacGregor’s compelling A History of the World in 100 Objects as readings to be discussed in class. This has meant the majority of my students finally did some reading (or listening, if they prefer the radio program version) for this, a lowly required class. Once I made the readings part of in-class writing too (asking students to respond to specific prompts based on MacGregor’s essays during the last 20 minutes of class time, and giving them feedback on their writing), everyone did the readings. If they didn’t, they were glaringly obvious and red-faced as the rest of the class scribbled away thoughtfully. Around the same time, I became really inspired by Smarthistory’s online syllabi (check out their growing Teaching with Smarthistory page) and the online syllabi sections that Dr. Marie Gaspar-Hulvat (she of the amazing Prezi presentation on Mock Student Conferences at CAA this year) had shared on her website. So, for my current summer course I decided it was time to take the plunge – bye, bye paper, and hello online syllabus. Right here, on Google Docs, able to be edited and read by my students, or in the version I’m linking to in this post, anyone who cares to look at the template and add their suggestions. Class: [silence. no one has read Stokstad, Chapter 2, and if they did, the two sentences on cuneiform bypassed them]. 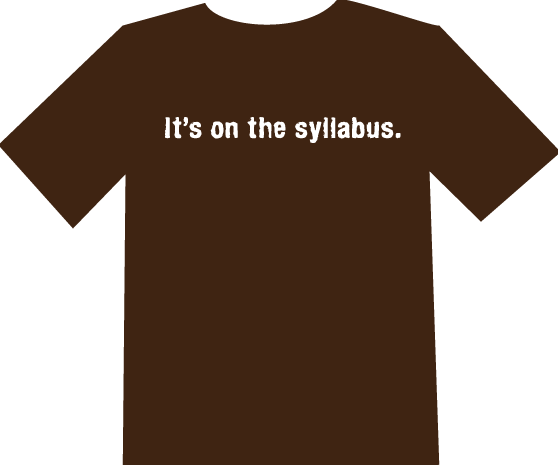 With the online syllabus in play, the class discussion last week was on fire because (thanks Parme!) the classroom had been flipped and the students knew all about cuneiform before I asked the question. We got to discuss beer rations, why clay was such a durable material, how it’s conserved today, how math came before literature, and how the students’ majors in accounting and administration are reflected in this object. The material was compelling, and interconnected – a Smarthistory video or an episode of 82nd and Fifth often pairs well with a MacGregor reading. The strength of an online syllabus as opposed to one survey text is that it mixes a range of texts, videos, and audio, so students aren’t locked into just reading – although the instructor could theoretically assign reading-only for requirements, and then videos for background, if he or she chooses. There’s also a column for “core images” and “key concepts and ideas” that I fill out each day after class so students know what we covered and what they can expect on their quizzes. I firmly believe this type of online syllabus resource is as legitimate for an upper level art history course (in tandem with books, primary sources, and with journal texts, which can be posted in digital form) as it is for a required survey course. It allows flexibility so teachers can update and innovate more easily each semester when they spruce up their syllabi as it allows for much easier peer-to-peer sharing between instructors. Got a great reading? A video that perfectly describes the lost wax process? Just update a shared version of the Google Doc within your teaching pool/department/art history friend circle. I’m sure I’m pretty late to the game and that others have been using flexible, additive online syllabi for a while for all types of art history courses. If you’re out there and willing to share, please do! Bravo Michelle–great idea! I’m happy to share my modern art syllabus, which combines on-line resources with other texts—and I’d love to have others use and/or build on it. I’ll just need to convert it to a google doc. Thanks Virginia! If you don’t have time to convert to a Google Doc, feel free to send it our way at AHTR and we’ll do it for you and post it here too. What a great resource! Thank you so much for sharing your syllabus with us. I’m continually looking for ways to improve my ancient art course (I’m becoming increasingly frustrated with Stokstad textbooks), so I’ll be sure to pour over your links during the summer months. I’m especially intrigued by your successful class discussion about cuneiform. Sounds great! Thanks so much for responding Monica! I share your frustration with Stokstad and just love MacGregor as a compelling way to discuss single objects in the classroom. I would really urge you to check it out if you haven’t already – it, and the other resources I have linked to on the Google Doc, have really changed the way I teach this course and the students learn the material for the better. Let us know what you think! We have two syllabi on Smarthistory and would be happy to post links to other examples – our syllabi include learning objectives, discussion questions ideas, and vocabulary. Hey Beth. Thanks for the links! Awesome – thanks so much for posting, Michelle! I was looking at SmartHistory but it’s so Western and linear. And the Khan Academy has nothing on non-western techniques. Anyway, this has inspired me to do more in-class exercises and less lecturing, which will be good for me and good for the students.